Yeah, see not everyone can do this. So, I'm not sure I get this exactly. I am pretty sure that I don't want to. there is the link to the origin of the sign. It's quite funny by itself, but I don't know if it translates well to the ad in question. Somehow the humor gets lost. 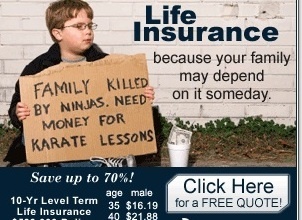 have some pity on the poor chap, his family was killed by ninjas! This really only funny if you get the inside joke -- and even then, it isn't funny. But, I have seen a ton of worse banner ads. For a banner ad, not so bad. It's at least a little funny. If your eyes happen to stray in its direction, you might be amused. What they should have done was a video banner with the ninjas actually killing his family. Now that would have gotten some mad clicks. I saw a guy in downtown Minneapolis with this exact sign last year. He even drew ninjas on the sign. The sign alone may be amusing and creative enough for an actual panhandler. It's the little kid/life insurance aspect that I find to be on the bad taste side of things. Weak concept with weak post production on a weak stock image. It's beaten by the move my insurance company pulled - they spent a monopoly $20 bill to my wife with the note "How many of these would you need if you lost Alistair tomorrow"...I wasn't sure if it was a joke or a threat (seriously, they did do that direct mail piece). It's funny, but I'd probably just laugh and not click on the ad. Of course I don't click on any ads. Im not in advertising, but I really liked this ad. Insurance is something i dont like to think about. But this has a black humor to it, that makes me think it might be worth while to check it out.